Benchmarks on Android devices have become sort of silly these days – some take them as gospel to decide if this device is better than that device. We recommend that you take them as if they are just one small puzzle piece to the overall board, because a result in a benchmark app is not something to base the purchase of a phone on. With that said, we still like to see them for devices that just so happen to be running a brand new quad-core processor that has not previously been benched. 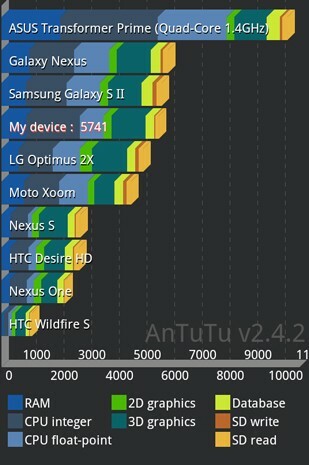 According to AnTuTu’s benchmarking app, someone showed up to the party with an Asus Transformer Prime and threw down. If you look at the screen shot above, you will see it clocked at 1.4GHz and putting out numbers that make every other device on the planet look like they were hangin’ with Prince in 1999. See the Galaxy Nexus and Galaxy SII in there? The SGS2 formerly killed any other device in site with its Exynos chipset – that will apparently happen no more now that NVIDIA’s Kal-El quad-core processor is on the way. Swiftkey X Alpha Introduces Multi-Touch, Can I Get a "Finally!"